The newest revision of Apple's littlest MacBook Pro packs faster flash memory and Intel's latest Broadwell chips, but the star of the show is its new Force Touch trackpad. AppleInsider went hands-on with the clickless wonder to see if it upholds Apple's tradition of finger-navigating excellence. 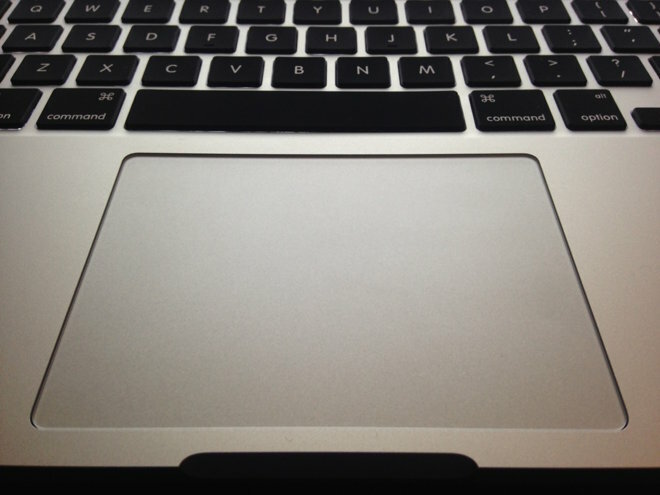 Let's get this out of the way up front: the Force Touch trackpad is really cool. The glass touch surface— the same found on every Apple notebook in recent memory— sits atop a totally redesigned chassis that relies on four strain gauges, one in each corner, to determine when and how hard the user is pressing down. When it detects a press, it fires off a vibration from a series of disparately-sized electromagnets seated underneath the pad, designed to mimic the visceral snick that you get from the older trackpads. The effect is stunning; it feels just like clicking with the previous generation, if a little softer and less jarring. Pressing down harder yields a deeper thunk that gives the impression of a significant deformation, even though the plate actually moves less than a millimeter. Perhaps more impressive is that the effect stays the same, no matter where on the pad you press. In the middle, at the top, or deep into the corner, it feels like you're always pushing directly on the center of a very satisfying button. 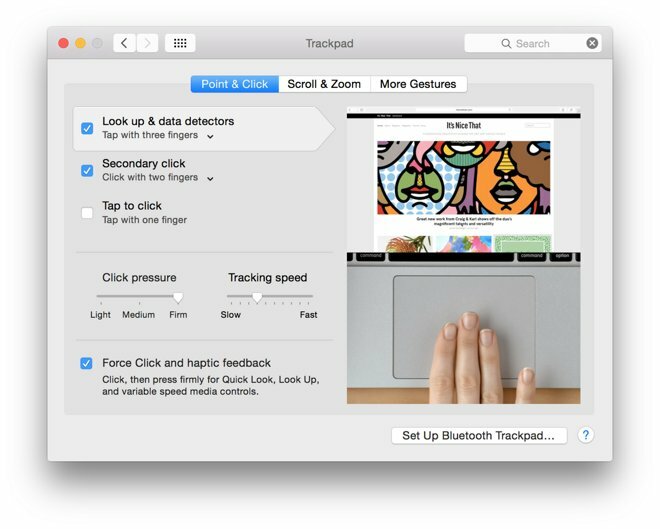 Apple has leveraged this newfound sensitivity to enable a "Force Click" gesture, which brings with it some new user interactions. By default, force clicking a file will open Quick Look; force clicking a word will look it up; and Quicktime will scrub through media faster as you press harder. These are all pretty fun, but they're also a little gimmicky. We suspect that the new trackpad will really come into its own once developers begin to take advantage of the fact that every new Mac laptop user has a relatively large, pressure-sensitive pad built in. You get a taste of the possibilities in Preview's new signatures pane. 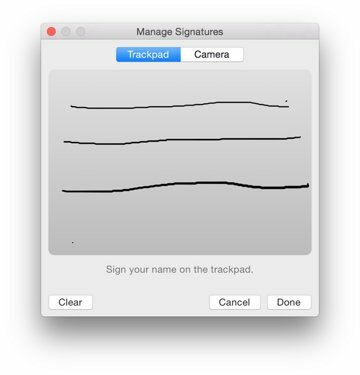 The old method— writing your signature on a piece of paper and holding it up to the FaceTime camera— still works, but now you can also sign directly on the trackpad. Using the pressure sensing APIs, Preview varies the width of the stroke based on how hard you press down. It's fairly impressive, capturing even the gradual taper that many people leave at the end of their final stroke. The new trackpad also yields some new options in System Preferences that allow you to fine-tune its operation to your liking. Most importantly, you can adjust the pressure required to register a click— Apple provides light, medium, and firm settings— which also adjusts the force of the haptic feedback. It's set on medium by default, which is not unlike a smoother, more well-lubricated version of the old "diving board-style" trackpad. Light is a little too soft for our taste, making it seem as though we're pressing on a loose panel, while firm most closely replicates the feel of Apple trackpads past. It's important to note here that we're not physically adjusting anything with these settings. Rather, we're changing the way the feedback electromagnets respond, which completely alters the way we perceive the click action— this is some seriously cool science fiction. Overall, we were blown away with the new trackpad. Apple's trackpads have always set the standard for the PC industry, and that hasn't changed. Crucially, it didn't take us any time to adjust to the new setup. The only difficulty we encountered when swapping back and forth between the Force Touch trackpad and the now-legacy version on our 15-inch Retina MacBook Pro was that we didn't want to put the new one down. Stay tuned for a more in-depth look at the trackpad and the new 13-inch MacBook Pro later this week.